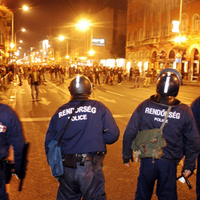 A weblog about the current Hungarian riots. Siege on Hungarian TV I. Siege on Hungarian TV II. Siege on Hungarian TV III. liuting: you could possibly find a myriad of other elements being an illustration gold, platinum www.balen...	(2011.03.29. 07:45) "We'll beat up everyone's heads, you rotten filth!" luckhu: Hello ,thanks for all www.tiffanysjewellery-us.com/tiffany-sets.html the great information y...	(2011.03.25. 04:22) "We'll beat up everyone's heads, you rotten filth!" luckhu: I enjoyed reading your nice blog. I see you offer priceless www.2011pandoracharms.com/ info.Congra...	(2011.02.22. 06:59) The Italian Connection: "Avanti Ragazzi di Budapest"
Aside from the short but definitely funny appearance of Hungarian ambassador András Simonyi on the Colbert Nation (watch the show here) rarely has a prominent Hungarian figure appeared on any major US station. Until now. Gyurcsány was interviewed by CNN’s Nic Robertson on Thursday. General performance? Horrible gestures, face buried in hands, bad English and a constant refusal to explain what it feels like to lie for so long. Did the message come through? Was there a message in the first place? Oh, sure. The message is that things are complicated. Cop ID Contest – Identify a Riot Cop and Win International Fame Now! "...watch the show here..." Where? There is no link included! nope, sorry. cnn has a transcript somewhere, but that's a cut version without the funny bits. I remember seeing it on YouTube. I didn't save it, but I remember that I found it using some combination of the obvious search words (like cnn, hungary, interview, gyurcsany, nic robertson and so on). It was really funny. Gyurcsány's English was so bad it was almost painful. And he clearly wasn't on top of the situation. Of course he never got uses to interviews like that. In Hungary, there are plenty of opportunities to appear only in "friendly" media, so he never had to face such embarrassing questions or interviewers who would insist on these questions being answered. You're right, the CNN interview is right there on YouTube. I've included it in the post. Enjoy. He has Borderline Personality Disorder.